For celestial bodies with central mass concentration, is smaller (see table 2.1.1). Depending on the angle between and , the impact may increase or decrease the spin of the embryo. The general problem of finding the spin of am accreting body is a very complicated many-body problem that is far from solved. Important progress has been made in the treatment of the two-dimensional problem when all the accreting grains are confined to move in the embryo's orbital plane. There is no obvious reason why a three-dimensional treatment (where the accreting grains move in orbits out of the embryo orbital plane) should not give the same qualitative results as the two-dimensional treatment, but this has not yet been checked by calculation. The conclusions we draw in the following sections are made with this reservation. Hence the nongravitational accretion from circular grain orbits gives a slow retrograde rotation. Even if is as small as 1 g/cm3, we have >> 0.5 X 10-3 per sec, which is an unrealistic value. This is an important typical case which we shall discuss. Hence we see that this accretional model has a very important property: The spin of a body produced by planetesimal accretion is independent of the size of the body for a constant angle of incidence . A model with this property explains at least in a qualitative way the spin isochronism (see sec. 9.7); i.e., the remarkable fact that the spin of bodies of mass ranging from 1018 to 1030 g does not show any systematic dependence on the size of the body. Spin isochronism lends empirical support for the type of planetesimal accretion theory we are discussing. It is also a strong argument against the idea of protoplanets with properties very different from the present planets, and it is impossible to reconcile spin isochronism with the hypothesis of planet and satellite origin by gravitational collapse of a precursor cloud. The planetesimal model used above is too simplified to be applicable. We shall therefore discuss two other more realistic models which also account for the similarity of spins among accreted bodies. ....move in Kepler orbits around the Sun. When a grain comes into the neighborhood of the embryo, it is attracted gravitationally. If it hits the embryo, it is assumed to stick. The mass of the embryo will increase, and at the same time the grain transfers angular momentum to the embryo. The ratio between angular momentum and mass determines the spin of the embryo. Dole (1962) has demonstrated that in order to hit an embryo moving in a circular orbit around the Sun the grains must be moving within certain "bands," defined in terms of their orbital elements. He calculates these for the case of grains which, before approaching the Earth, move in circular orbits around the Sun (see fig. 13.4.1). Giuli has made similar calculations which also include grains moving in eccentric orbits. (Like Dole, he restricts his calculations to the case of particles moving in the orbital plane of the embryo.) Further, he has calculated the spin which a growing planet acquires when it accumulates mass in this way. He finds that a planet capturing exclusively those grains moving in circular orbits will acquire a retrograde rotation. However, if accretion takes place also from eccentric orbits, the rotation will be prograde (assuming equal grain density in the different orbits). This result is essentially due to a kind of resonance effect that makes accretion from certain eccentric orbits very efficient. In the case of the accreting Earth, such orbits are ellipses with semimajor axes a greater than 1 AU which at perihelion graze the planet's orbit in such a way that the grain moves with almost the same velocity as the Earth. There is also a class of orbits with a < 1 AU, the aphelion of which gives a similar effect. In both cases a sort of focusing occurs in such a way that the embryo receives a pronounced prograde spin. Let us reverse time and shoot out particles from the Earth. 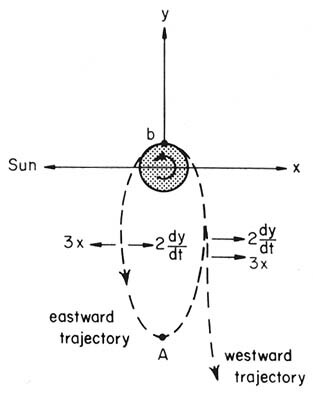 In case a particle is shot out from the 6-hr point of the Earth (x = 0, y = ) in the eastward direction with slightly less than the escape velocity, it will move in an ellipse out in the -y direction toward its apogee A. The Coriolis force 2dy/dt and the solar gravitation gradient 3x will act in opposite directions so as to minimize the net disturbance. On the other hand, on a particle shot out in the westward direction from the 6-hr point the two forces will add in such a way as to deflect it from the ellipse far out from the Earth's gravitational field, where it will continue with a very low velocity. Reversing the direction of motion we find that particles from outside can penetrate into the Earth's field in such a way that they hit the 6-hr point of the Earth's equator from the west but not from the east. Hence the particles form a sort of a jet which gives a prograde spin. Similarly, particles moving inside the Earth's orbit can hit the 18-hr point only from the west, and they also give a prograde momentum. 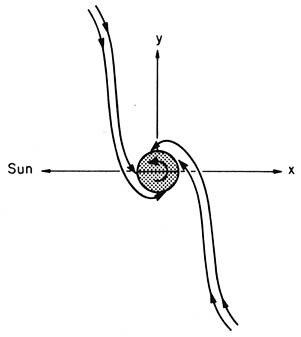 FIGURE 13.4.3.-Planetesimals originally moving in slightly eccentric Kepler ellipses in the solar field may hit the Earth in two jets, both giving prograde rotation. ....of 0.03. Most other particles hit in such a way that on the average they give a retrograde momentum. This value is larger by a factor of about three than the average for all planets, including asteroids, which are not affected by tidal braking. Giuli's calculations are based on the simplest possible planetesimal model, namely, that an embryo grows by accretion of those grains which hit it; collisions between the grains, for example, are not taken into account. It is highly satisfactory that this simple model gives the correct order of magnitude for the spin. It is reasonable to interpret this agreement as strong support for the theory of planetesimal accretion. It should be mentioned that, if for some reason a planet accretes mainly from grains moving in orbits with small eccentricities, it should have a retrograde rotation. This means that if there is some reason to assume that Venus has accreted in this way, its retrograde rotation might be explained. We shall discuss this in sec. 13.6.3. (2) That planetesimals hit randomly. There is no reason to doubt the second assumption, but whether the first one is correct depends on the type of accretion. As we have seen in ch. 12, mere are three different cases: Runaway accretion may be early, late, or delayed. We shall discuss these three cases in sec. 13.6.1.
and typically equals 0.33 (see table 2.1.1). The Giuli process gives to an order of magnitude Z = 0.1. In order to make Z' comparable we need only have = 3 percent. Hence, even one planetesimal with only a few percent of the mass of the embryo can under favorable conditions completely change the state of rotation of the embryo. Levin and Safronov (1960), Safronov (1958 and 1960), and Safronov and Zvjagina (1969) on one hand, and Marcus (1967) on the other, have  considered the question of the relative sizes of bodies that collide randomly. Their results are not in quantitative agreement with each other, but they all show that statistical accretion should give a spin that on the average is of the same absolute magnitude as in Giuli's case, but directed at random. Whereas an accretion from small grains (such as Giuli's mechanism) gives spin axes perpendicular to the orbital plane, the random accretion of large planetesimals gives a random distribution of spin axes. It is possible that this mechanism of statistical accretion is applicable to the spin of asteroids. However, for the small asteroids the escape velocity is very small and our models may meet difficulties because the approach velocities must be correspondingly small. It is possible that such low impact velocities are reconcilable with jet-stream accretion, but the problem no doubt needs further clarification. We have found (ch. 12) that after exhaustion of the parent jet stream by runaway accretion an embryo accretes planetesimals that are very small. This means that the premises of Giuli's theory are applicable. Before and during the runaway phase, however, the embryo accretes planetesimals, some of which are of a size comparable to that of the embryo. Hence, a random spin vector due to the statistical arrival of large planetesimals is superimposed upon the spin vector which in the Giuli case is perpendicular to the orbital plane. The absolute value of the random vector is probably on the average about the same as the regular spin vector (see fig. 13.6.1). Combining the above conclusions with the results on accretion in jet streams from ch. 12, we first discuss the cases involving an early runaway phase (Jupiter, Earth, Venus, and Mercury). Random spin is received by the growing embryo only before and during runaway accretion while it adds the first small part, typically 10 percent of its mass and 3 percent of its spin. Hence during most of the accretion the condition of infinitely small grains is satisfied, which means that the inclination of the equatorial plane towards the orbital plane should be small. This is indeed what is found for the case of the spin axis of Jupiter, the inclination of which is only 3°. Venus has a retrograde spin, for reasons that will be discussed in sec. 13.6.3, but the inclination of the axis of spin is only = 1° ( = 180° - 179°). In the case of the Earth, we should use the spin before the capture of the Moon. We do not know this value with certainty, but different theories for the evolution of the Earth-Moon system give low inclination values. Gerstenkorn (1969), for example, sets = 3O. The inclination of Mercury's spin may be influenced by its resonance capture. The bodies which had a late runaway accretion (Saturn, Mars, and the Moon) have typically obtained 75 percent of their mass by accretion of a small number of bodies of relatively large size (statistical accretion). Only the last 25 percent of mass is accreted from small bodies (Giuli accretion). However, the Giuli accretion influences the spin more decisively because, due to the larger radius of the embryo, impacting planetesimals impart more spin angular momentum. Hence we would expect a superimposed random vector from statistical accretion of about one-half the regular vector from Giuli accretion. We find that both for Mars and for Saturn the spin axes inclinations are substantial (25° and 26°). We know nothing about the primeval spin of the Moon. During a delayed accretion the entire process takes place by collision of large bodies (statistical accretion), so in this case we should have a large random spin vector. This applies to Uranus with = 98° and Neptune with = 29°, which indeed have the largest spin inclinations among all planets, although the difference between Neptune and Saturn is not large (see fig. 13.6.1). FIGURE 13.6.1. Spin vectors of the planets are represented by the light lines (length ). The Giuli-type accretion gives a vector bc equal to Jupiter's spin. The statistical accretion should give the vectors from c to the dots representing the different planets. Dashed lines represent "late runaway accretion," the heavy lines, "delayed runaway accretion." The number of planets we can apply our discussion to is only half a dozen. Our accretion mechanism involves a statistical element, but our sample is of course too small for any statistical analysis. However, we have found that the inclinations are smallest in cases where we should expect low values, and highest in the case of Uranus, where we should expect the random factor to dominate. This may be as far as it is possible to carry the analysis. (1) Assuming to have the same value for the primitive Earth as the present value for Jupiter, we find = 6 hr. This is higher than the Gerstenkorn value (sec. 13.6.1) but not in conflict with any observational data. It would speak in favor of a lunar capture in a polar or prograde orbit (see ch. 24). (2) The period of Mars, which only by coincidence is similar to the period of the Earth today, is longer than expected by perhaps a factor of three. It may be futile to look for an explanation for this, other than the statistical character of the largest part of the Martian accretion history. In fact, accepting the Jovian accretion as normal for a nonrandom accretion, the vector from Jupiter to the other planets in fig. 13.6.1 should represent the random contribution. We see that the vector Jupiter-Mars is only about half the vector Jupiter-Uranus. In view of the fact that the entire Uranian accretion but only about half the Martian accretion is to be considered random, we have no reason to classify the slow Martian rotation as abnormal. The same reasoning applies to the extremely slow rotation of Pluto (~6 days). As Giuli has shown, accretion exclusively from grains in circular orbits gives a retrograde spin, whereas, if grains in eccentric orbits are also accreted, the spin may become prograde. If we can show that the planetesimals from which Venus accreted moved in more circular orbits than the bodies from which the other planets accreted we may solve the problem of the anomalous rotation of Venus. A suggestion along these lines has recently been made by Ip (1974a). 1 The term gravitational secretion should not be confused with the gravitational instability of a gas cloud which, as shown in sec. 11.2, is not applicable to the formation of celestial bodies in the solar system, excepting the Sun.